When you are a parent of a female child, you will at one point or another need to use a hair tie. If you're a Mom, you already know about finding a good hair tie. Then you have the situation where you have a child that is school age and you are plagued with finding the best Valentines for your daughter to hand out in class. CyndiBands has solved these issues for you! The difference in quality amongst the different hair ties might not be obvious to everyone, but I am aware of what makes a high quality hair tie. I feel that making our hair ties in the US results in a higher quality hair tie than those made overseas. Also, a while back we had some feedback from customers saying the ends of the hair ties were fraying. We did some market research and noticed that other hair ties we came across had the same issue. In December 2012 we began manufacturing Cyndi Bands with a process that heat seals the ends. Starting January 2013 all Cyndi Bands we shipped were made using this process. It has made a big difference in the quality of Cyndi Bands. In addition, I feel that we offer the best color options, which includes the create your own set. This set allows customers to choose the colors in a set of 6 or 10 hair ties from our vast selection of colors. I first told Ally that we were doing a review with CyndiBands and of course she walked away and didn't listen. When the package came in the mail she couldn't have been more excited! I on the other hand had to take a deep breath. You see, Allyson is a girl that likes to have her hair done but doesn't like to sit still and let Mommy do it. At the end of the night she hate when I take the hair tie out of her hair too. Hates it so much that she swats at my hands and screams bloody murder! I am happy to report the screaming has stopped since using CyndiBands! They grip your hair and hold your pony tail in place but don't rip your hair out in the process! CyndiBands makes ties for all different occassions! So many holidays to color coordinate and different styles to fit into! What's even more cute is the little Valentine's for the girls in your child's classroom! Forget the candy or boring little Valentine that says something on it that your child may not even understand! Let your little hand out Cyndibands Valentines! 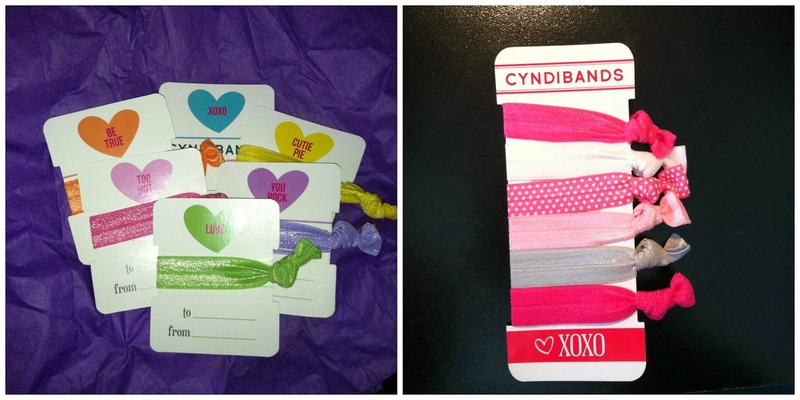 I urge you to check out CyndiBands for yourself of a person in your life that could benefit from these cute bands! You could even wear them on your wrist and create a little fashion sense for yourself! Check them out online and on their social media channels. Disclosure: A special thank you to Cyndibands for giving Sweet Cheeks and Savings this opportunity to work with them. We received these items free of charge from Cyndibands. No monetary compensation was received or offered, nor were we under any obligation to write about this product. All opinions expressed are honest thoughts. We were not offering any sales or taking orders for this item. We will not receive any compensation in connection with any sales of this item. Yay! I could totally use something like this. I only wear my hair up when I workout, but I always hated it because when I took out the hair tie, half the hair on my head came with it. I know I could use these too. Those other ones just break my hair right off sometimes. These being thicker are going to work out perfectly. My hair is getting longer gain and I know by the summer, when the hot weather hits with a vengeance, I am going to want to pull my hair back in a pony. It will be really nice to toe it back with something that doesn't pull out my hair--it is thinning enough already! I love the look of these. Great colors too! Hadn't heard if them. I am soo on the hunt for them now! Those are cute! I tend to buy Madison's hair accessories from Gymboree because they are cute like these as well and don't hurt her hair. I may have to look into these. Thanks for sharing. These are seriously so cute! I love the print for Valentine's Day! I love hair ties like that! They are so much fun and work so much better than regular hair ties! I will have to check them out, thanks! I wish we have them here - I would benefit from this since I tend to tie up my hair especially when I'm at home. Plus, I love how they look and their colors, too. I've seen these before, and they look like such a great idea! It's so hard to find hair ties that don't break hair. I've only seen these one other time before, but they look great! I'm pretty picky about what I put in my hair, because some things pull and some give me a headache! I doubt these would do either. I've seen these hair tie but I don't own any. I've hear nothing but good things about them. Maybe I should snag a few for myself. Thanks for sharing! Sounds like this will help those with long hair. Thanks for the information. Oh my gosh they are so adorable. I love the colors. You are so right they would make great valentines gifts for girls. My granddaughters would be thrilled to have a hair tie that does not pull their hair out with it. Those hairbands are so cute. My daughter was the same about her hair bands when she was that age. These hairbands are so beautiful! Love that there are so many great designs to choose from. Have to get couple of them for my daughter! I love these for day to day wear as they are much easier on your hair. Unfortunately I have to go back to the traditional hair bands for running though because these fall out. I've used some like these and they are really nice and never grab your hair either! Oh these look amazing. I need to get some for my daughter. I hate how her rubber bands rip out so much hair. I've been seeing these hair bands all over the net. they are so popular, lucky you got to try em first hand! They are so cute! In a household of mostly women, hairbands are necessary. I love the colors and your write-up. I've heard a lot about these lately! They do sound great! My daughter is in gymnastics, and we need something that will keep her hair firmly in place during class. These would work wonderfully, I bet! I love the color options on these and that they don't rip your hair out. These sound really good especially that they do not rip the hair out and also have great colours. I was just looking at those the other day. I use some that aren't supposed to pull now, but they actually do soooo.. I love the selection of colors especially the polka dotted ones. . This is what me and my daughter needs! My daughter has long curly hair - finding the right band is definitely important. Even fo rme I have that issue of hair being pulled out! These look great! My daughter has thick hair so this would work!!! I really want these for my hair! I have crazy thick hair and it hurts to put it up. See, not just for kids, right? I love to pony tail my hair and this is nice that it wont rip the hair during and after wearing it.